Chocolate Face Pack And Benefits For Skin. Who can say no to chocolates? Apart from satiating our taste buds, chocolates have been a booster for energy as well as our skin. Chocolates not only soothe the skin but also are also known for their therapeutic properties. Chocolate benefits for skin are innumerable that include shooing away acne and pimples and helping to get rid of spots and marks. It is also one of the best natural tan removals and protects the skin from harmful ultraviolent rays. 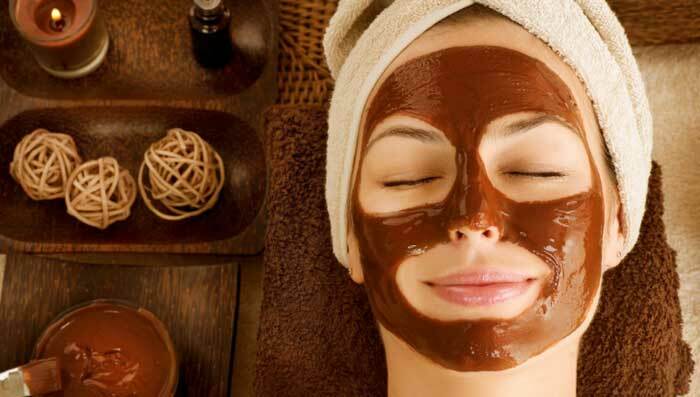 Chocolates can be used in various ways for skin treatment, and the easiest and fastest way is through homemade face packs that can be used for all skin types and concerns. Here are a few chocolate face masks and packs listed for a fun skin care regime. It does sound like a divine combination, doesn’t it? Both chocolate and honey have moisturizing and skin hydrating properties. Honey adds nourishment and enhances the texture of the ski while giving you an even complexion. A good remedy for dry and dull skin, this chocolate and honey mask, when applied regularly can give you a beautiful and glowing skin over a period of time. For those who have oily skin suffer from pimples and acne frequently. Hence this mask is best to get rid of all impurities in the skin. This chocolate face mask benefits include fighting off excess oil secretion from the sebaceous glands and help in getting rid of the bacteria that causes skin infections. Apply the pack on the face and neck areas evenly and keep it on for 30-35 minute. Chocolate has the tendency to dry the skin so always remember to follow up the process by massaging your skin with a moisturizing cream like Dabur Gulabari Moisturising Cream for added softness and rose like natural glow. Dark chocolate for skin is a good idea as it adds glow to the skin and rejuvenates it to make it look fresh & young. Along with fuller’s earth, it absorbs excessive skin oil and keeps the face clean and free from harmful bacteria. Also, antioxidants in orange juices make the skin lively and supple. This chocolate face pack benefits are immense as along with skin tightening and toning, it also helps in reducing fine lines and other signs of premature aging. In a bowl break an egg and separate yolk from it. Walnuts are the best way to keep skin elasticity intact. It helps in moisturizing the skin and unclog pores to keep impurities and bacteria away. This Dairy Milk chocolate face pack clears out blackheads and whiteheads and keeps the skin hydrated. This Sea Salt and chocolate face pack works best as a toner for all skin types. It also aids in maintaining the complexion and texture of the skin while exfoliating dead skin cells and pores off the surface of the skin, keeping them open and helping the skin to breathe. If glowing and radiant skin is what you desire, this is the face pack you must try and include in your beauty regime. The above-mentioned chocolate face masks are an effective way to keep the skin young and radiant. But there is a lot more to chocolate than meets-the eye. Yes, naysayers may say it leads to weight gain, but if had in moderate quantities, it can actually do wonders for your overall health and well-being. Don’t believe us? Read below the many benefits a small bar of chocolate can provide you that can go a long way in keeping your body and skin healthy. Eczema is a very common skin problem that occurs due to unhealthy skin. Chocolate when used on skin helps in reducing inflammation thereby getting rid of problems like eczema and frequent occurrence of acne and pimples. Our skin needs a lot of protein to remain healthy and so applying chocolate can help in making it healthy and glowing. Chocolate hydrates and moisturizes the skin and helps in making it soft and supple. It also nourishes the skin cells and promotes the growth of new, healthy cells. It also works against the harmful ultraviolent rays protecting from severe skin problems like cancer. Being full of antioxidants, chocolate helps in keeping the infections, both on the outside and inside the skin away. Chocolate contains minerals like copper, zinc and iron that promote and regulate growth of healthy cells and reduces collagen breakdowns which delay all signs of premature aging. Dark chocolate for skin is like a magic potion. It not only helps keeping it malleable and supple, but also helps in increasing the thickness of inner layer, keeping it healthy as well. The antioxidants and flavonoids help in regulating blood circulation in the skin, keeping it healthy and glowing.